Did Exploding Airbag Manufacturer Cover Up The Results Of A Test? The massive recall of vehicles with airbags installed by the Japanese firm Takata just gets worse and worse. To recap, the airbags were installed in millions of cars. Many of the those vehicles are no longer in production, but they’re still on the road. Takata is a huge supplier of airbags worldwide, so the defective airbags are in cars produced by many different manufacturers. Here’s the scary part: the defective airbags have a part that can fragment when the safety feature deploys, sending shards of metal flying into the cabin. “Shrapnel” is the word that has been most commonly used to described these shards. Five deaths have been linked to the defect, along with dozens of injuries. Carmakers have taken the extreme step of recommending that drivers prevent people from riding in the passenger seat until the defect can be fixed. Unfortunately, there aren’t at the moment enough replacement airbags available to fix all the recalled vehicles, so automakers are also telling some people to avoid driving altogether. It’s hard not to be scared by this recall, which goes right to the heart of something that the industry has been selling for decades: safety. Now new and possibly devastating information has emerged. Takata on Thursday denied a report that it carried out a secret test — and covered up the results — on a faulty airbag inflator linked to as many as five driver deaths. 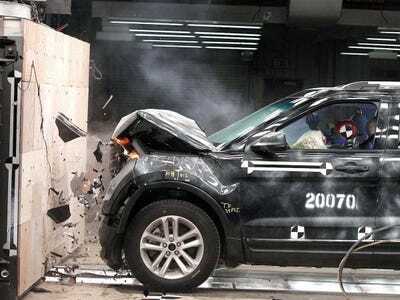 The embattled firm acknowledged that it did tests a decade ago, but said that they were unrelated to the airbag at the centre of the current crisis. “Our firm did not carry out such test (on inflators) in 2004, and we absolutely did not cover-up test results, as reported in the story,” the firm said in a statement, referring to a report last week by the New York Times.